These are two scrapbooking pages I did years ago but I thought I would share them since the theme is Christmas. It's fun to look at our pages and see the old memories. I wish I could scrapbook all of life's memories but I guess that's not possible so I will just have to settle for a few. Oooo Karen! These are really gorgeous LOs! Keep them coming! 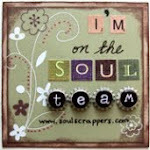 Love to see you there at Scrap and Stamp Saturday! Thanks for playing with us at Scrap and Stamp Saturday. You did a great job creating this page!